Visiting the island with the primary intent of whale watching? Well here’s where and how to see the whales this summer. Our local, or resident orca whales are known as the Southern Resident Killer Whales (SRKW) comprised of three pods, or families named J, K and L pods. At the time of this writing, there are 89 whales in this resident community. Killer Whales are the largest of the dolphin family reaching a body length of 30 feet, and weighing 9 tons. They are found throughout the worlds oceans, (mostly cold water) and have adapted to a wide range of habitats and prey resources. They are at the top of the marine food chain. 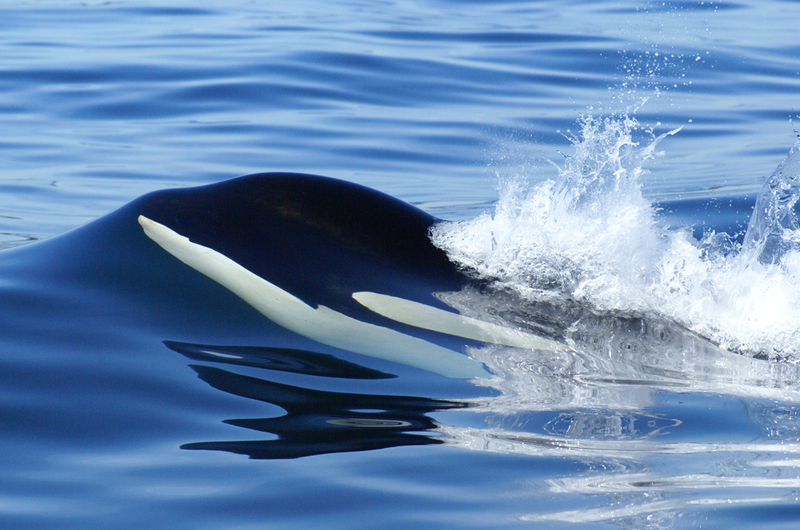 Killer Whales are not only the largest in the dolphin family, but are believed to be the most intelligent as well. Their brains weigh approximately 16 – 20 pounds. (In a recent article (abc.go.com) a researcher observed that orcas think ahead and plan! The orcas in the tank that he was observing actually set traps for sea gulls by shredding bits of their fish, bringing the first to the bottom of the tank, then releasing the fish to float to the surface where the gulls would land to eat the small bits. Then, the trap would spring; the orcas would rush to the surface and capture the gulls. Prior to 1976, the number of Resident Killer Whales was just a guess. Thanks to Dr. Michael Bigg, Ken Balcomb, and Graeme Ellis, accurate counts became possible. The reason that it became possible was the development identification photo charts. Positive identification of each animal lead to knowing for certain how many whales there were. Photo identification also taught us that some of the orcas were resident, some transient, some offshore and some northern resident. In 1976 Ken Balcomb confirmed 71 resident orca whales were present in these waters. How are orca whales identified? The saddle patch right behind the dorsal fin is like a fingerprint. No two orcas have the same patch. Also, height and shape of dorsal fin can be useful as well as notches, scratches and if the fin leans to one side or the other. The SRKW are a matrilineal animal. Both sons and daughters stay with their mother during their lifetime. Like humans, females live longer than the males. Females have been estimated at 90 years old. Males have been estimated at about 60 years. And like humans, the SRKW come into sexual maturity in their teens. How do these our resident orca differ from other orca in the same waters? The SRKW share the same language, and each individual pod also uses its own dialect. They are territorial and their territory spreads from northern California to northern Vancouver Island. 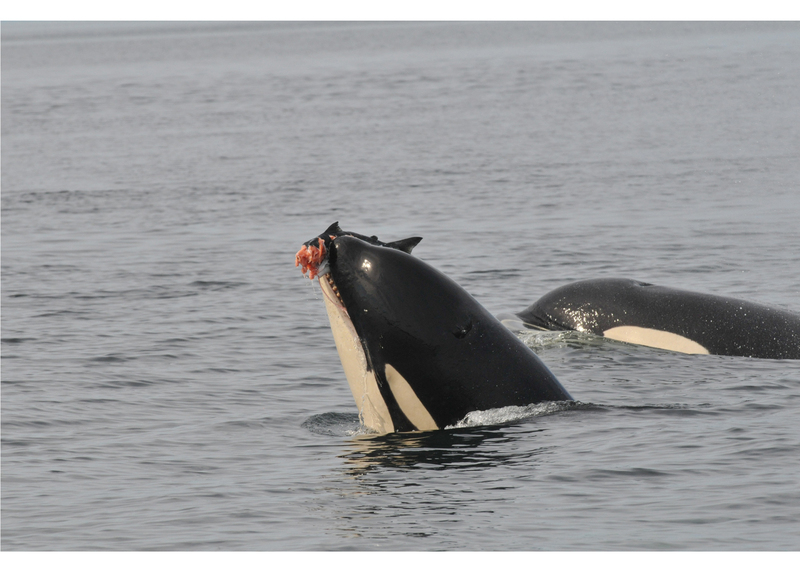 They eat almost exclusively fish, unlike other orca, which eat mammals. Their favorite fish is salmon, and of the species of salmon they favor Chinook. It is believed that Chinook are their favorite because they are the largest species in this region, and provide the most nutrition and fat. Orca’s teeth are conical, so they do not chew their food. They bite or tear and then swallow the pieces whole. They can also be seen “food sharing” which may be another reason for choosing the larger of the fish. The ratio of fish eaten is: 75% Chinook, 18% Chum and 6% Coho with 1% to bottom and other types of fish. 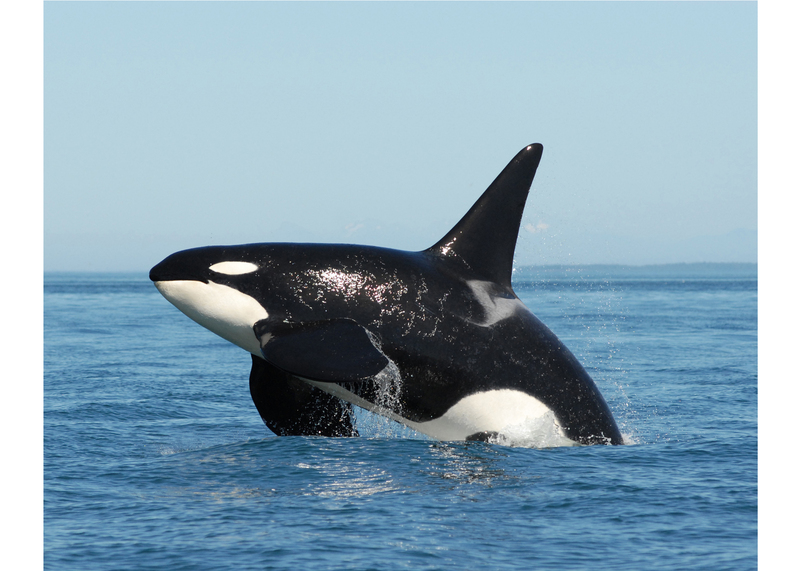 An adult orca needs about 200 pounds of fish per day. 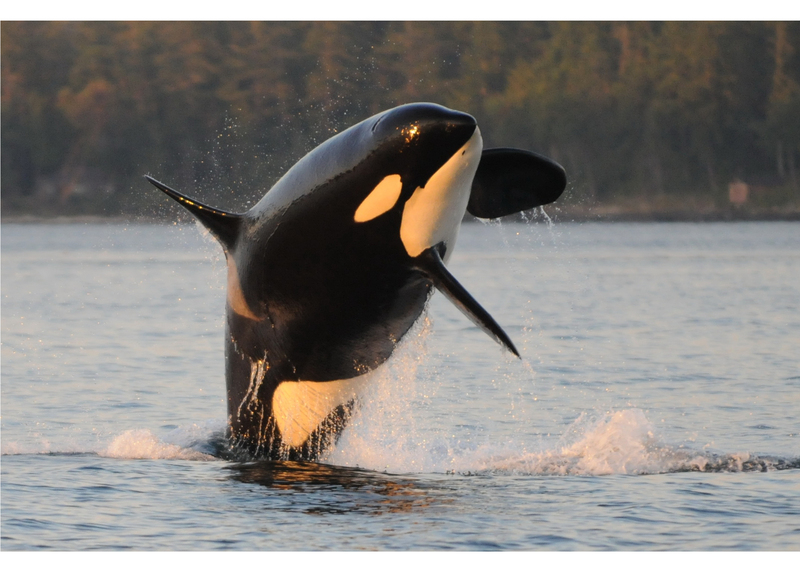 Orca find their food primarily via sonar, or echolocation. This sonar is produced from the front bulbous portion of their head, which contains oil. The sonar sound is beamed out, then returns with a sonar “picture” of what is out there. Their sonar technique is so perfected that they can distinguish between different species of salmon! Tests were done on captive dolphin blindfolded, and they could find a dime on the bottom of their tank. Orca feeding strategies include trapping fish by using underwater cliffs and shoals, or the surface of the water. People often ask, “Do whales eat under water?” They eat above and below water. They have special bladders that look like grape clusters. 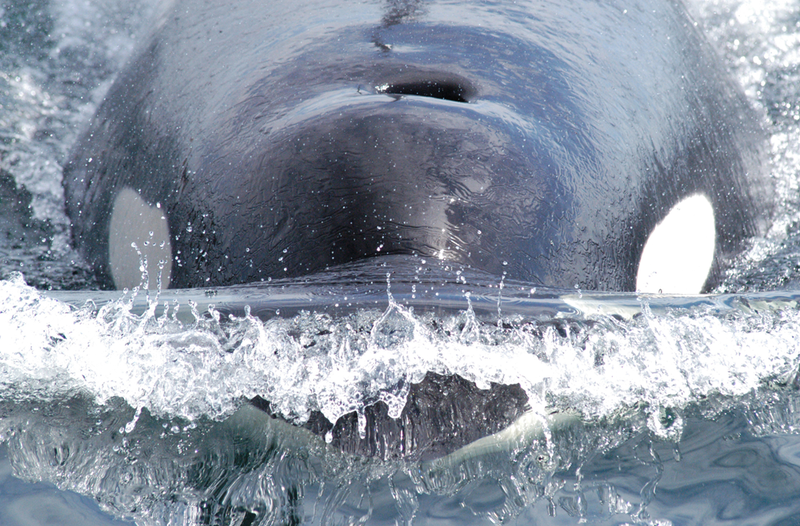 These bladders are powerful and remove excess salt from the whale’s body where it is excreted as waste. Orcas give birth about every 2 – 5 years after reaching sexual maturity. The gestation period is 16 – 17 months. Babies are generally 7 – 8 feet long and weight about 300 – 400 pounds. When giving birth, other female orcas surround the birthing mother and assist in the birth. Once the baby is born, they push it toward the mother’s teat, where the white markings become imbedded in the baby’s mind – imprinting it to that most important spot. The mother’s milk is the consistency of condensed sweetened canned milk – extremely thick. Babies nurse for at least one year. The SRKW are here in the San Juan Islands mid April to about first part of October. They tend to favor the waters right off the west side of San Juan Island. This is due to the runs of salmon that swim there. There is a ledge or overhang on the west side of San Juan Island. Fish naturally swim along these ledges, providing an excellent foraging area for the whales. During the remainder of the year it is uncertain where K and L pods go. Out to open ocean is the general thought. 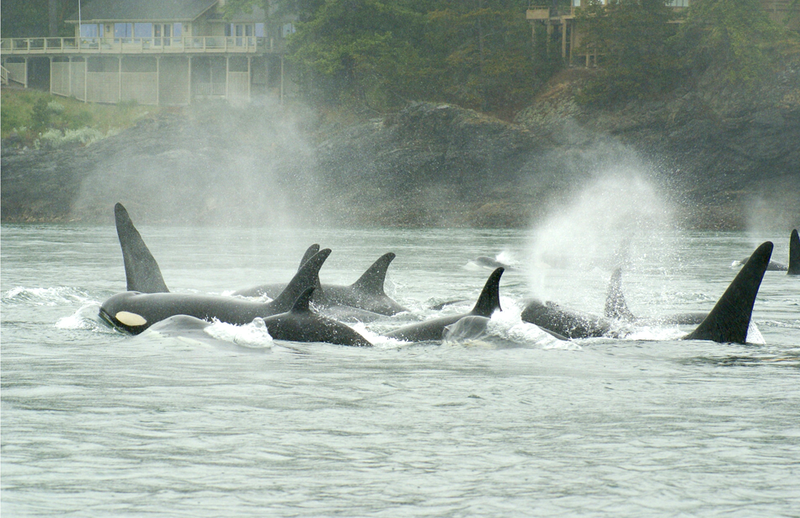 J pod can occasionally be seen off Seattle, Whidbey Island and very occasionally San Juan Island. 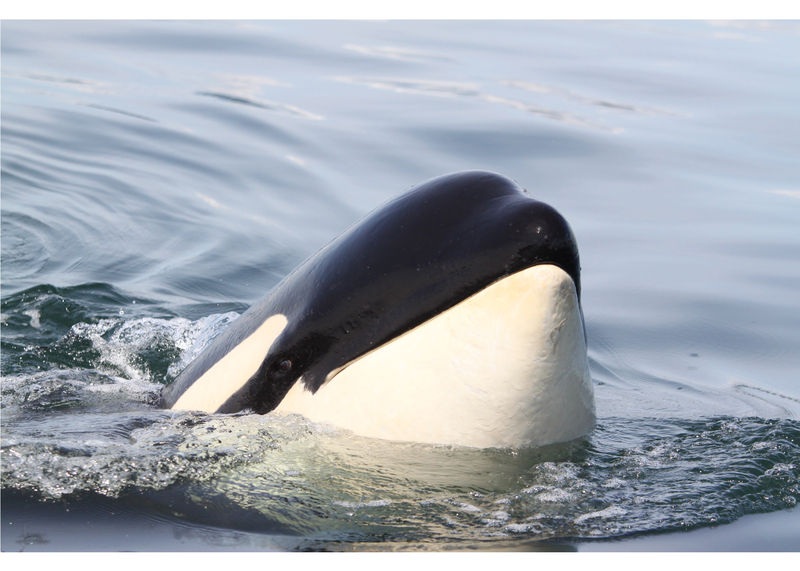 We still have large knowledge gaps to contend with in our understanding of the complex lives of the different types of orca that reside in the waters off the San Juan Islands in the Salish Sea. Ready to book your whale watching trip?